Not to be confused with World 8-2. Area 8-2 is the second course of Super Skywheel and the sixty-fifth course overall in Mario vs. Donkey Kong: Mini-Land Mayhem!. The level features four Mini Marios. The Mini Marios begin at the bottom center on a platform on the lower level, with the exit door on the bottom left. In order to reach it, they must simply be guided via a series of Shy Guy Blocks and Purple Conveyors to it. The M-Token is located at the very center, being lured by two Shy Guys. To collect it, the Mini Marios must move from their starting position while the Shy Guys are lured to any Shy Guy Block available via Purple Conveyors, then the Mini Marios must travel to the collectible. 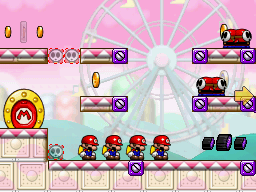 The Mini Mario Card is located at the top left, atop a platform on the upper level. The two Shy Guys at the top must be lured to the Shy Guy Blocks via Purple Conveyor, then the Mini Marios must take the same route to reach it. In order to earn a trophy, the player must score 15200 points. In Plus Mode, the two Mini Peaches must be guided to the exit door first, followed by the two Mini Donkey Kongs.